Sometimes movement and change happens in the most unexpected ways and times. When you find yourself in that position, as I’ve learned, it’s best to take stock, breathe and dig deep enough that you can’t help but find a glint of humor. Which has been particularly important for me to keep in mind, given the upheaval that’s taken over my little neck of the woods these past couple of weeks. In point of fact, right here, on home ground. I moved in. There was a land blessing ceremony on the rice field one patch away from me. Then I came home the next day find piles of offerings placed around my terrace. No explanation, but living here as long as I have, I knew exactly what was coming next. Clarification was unnecessary; opposition would have been uncalled for. With all the hustle and bustle, mats being unfurled, furniture moved aside, offerings p laced here and there, I knew precisely of what he spoke. 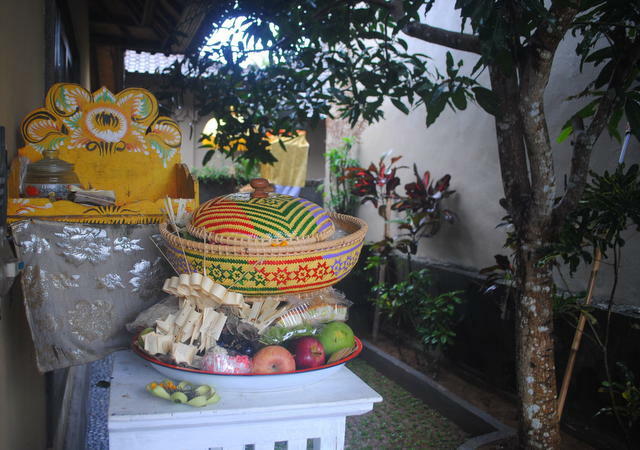 What to do when Balinese ceremony beckons? Why, join in, of course. So I donned my sarong and sash and joined them on the terrace. Tidak apa apa, I told him, of course, go ahead. Petals, holy water, fruit, cakes, coconut husks exploding, dried stalks smoking, and a priest ringing his bell – the whole shebang. Under cloudy skies, with a threat of rain still hovering, the show was over in less than one hour. They cleaned up, offered me leftover fruit and kue (this day, palm-sugar filled cakes) and off they went. I went back to my reading and writing. Then, over a few days, the trucks of wood and stones started to appear out front. Clued in as I am, I knew it was only a matter of time. I tried to fit in as much reading and research as I could… as if that might delay the inevitable. Without warning, the hammering, digging, sawing, soldering and welding began. The noise levels escalated. The dust swirled. And I stood at my doorway, gaping, wondering how best to straddle both the frustration and hilarity of my unanticipated predicament. So now, for all ye inquiring minds: yes I do, indeed live at the edge of one of Ubud’s much-desired but ever more disappearing rice paddies. But fear not: I also live far-too-close to the edge of a construction site – just one of thousands still sprouting around this little island at the edge of the sea. Such are the ups ‘n downs of life here, as you know! Trying to take it in stride 😉 Will you be visiting this year? Condolences. The building project just across the river from me started about 6 months ago. Hammering, tile cutting, etc. becomes part of the background music of every day! Ha ha.